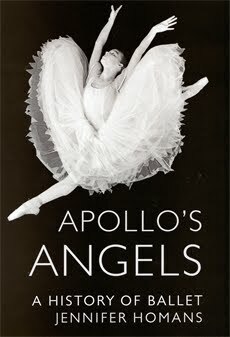 I'm looking forward to reading former ballerina and NYU professor Jennifer Homans' new book, "Apollo's Angels: A History of Ballet." I'm happy to see she's titled it "a history." The book is on The New York Times bestseller list, and Homans has been popping up all over dance publications recently with the release of the book. I particularly enjoyed reading an interview with her in The Wall Street Journal, addressing writer Stephen Kurutz's questions about her impressions of "Black Swan." Kurutz: What did you think of "Black Swan"? Homans: It draws on the darkest features of the ballet world, exaggerates them and makes them the vehicle for Natalie Portman's extraordinary descent into madness. If "Black Swan" is a portrait of the ballet world today, it's certainly a portrait of an art form that lost its soul. Everything is through a glass darkly and magnified. If you were watching that film, why would anybody ever dance? Kurutz: One of the stars of the film, Mila Kunis, said ballet dancers exhibit obsessive compulsive tendencies. Do you agree? Homans: Dance attracts a kind of person who is often very able to submit to discipline. It has a monastic side to it. It demands tremendous commitment, tremendous sacrifice. I would call it ritualized, not compulsive. Yes, some dancers are compulsive but so are some writers and some actresses. I think people who are artists are fully engaged in their art and there is something compulsive about that.